Thai Massage is very popular nowadays. It is being offered in spas around the world. Here in Thailand massage schools are popping up everywhere, and students come from all over the world. Many books and DVDs are available for home study. However little is written about the challenges that therapists can encounter. There are two sides to being a Thai massage therapist. New practitioners see mostly one side: Meaningful work with decent income, holistic, positive, and beneficial healing work, interaction with many interesting and wonderful people (clients and fellow therapists), the ability to have one’s own business, set one’s own working hours, and contribute something of value to the world. I live in the center of the universe as far as Thai Massage is concerned – Chiang Mai, Thailand. 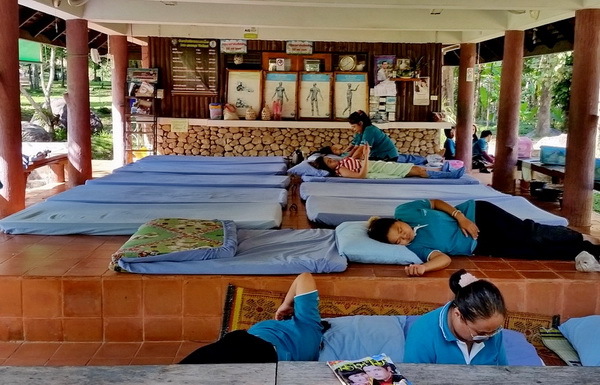 There are hundreds of Thai Massage shops and schools all over town, and tens of thousands of people come from all over the world to study here. So the question is: Is Thailand the best place to study Thai Massage? Here are the pros and cons. Some good reasons to study here is that it is cheaper than in the west. The cost of living is low, the country is beautiful and the people are friendly. If you combine a vacation with the study of Thai massage, you have a really attractive combination. You easily meet like-minded students and there are many opportunities for networking and making friends. Another advantage is that you can choose from many schools and even study in several of them. Continue reading…Should you Study Thai Massage in Thailand? 1. Since many Thai massage moves are very similar to yoga postures, it can help students if their yoga teacher can gently loosen them up and maneuver them into a position through the help of Thai massage techniques. 2. Generally in Yoga teacher trainings there is not much focus on the quality of touch. Since yoga teachers often need to touch their students to adjust a posture, it can be helpful to have more knowledge about the quality of touch that is derived from massage training. Whenever I travel somewhere in Asia I always try out a local massage for better or for worse. Sometimes it was definitely for the worse, and here are some of my more bizarre experiences. I was in the tourist district on Kao San Road in Bangkok and went to a typical Thai massage shop. Many floor mats were lined up in a big room with many sessions going on simultaneously. I was assigned a male therapist. The first thing he did was turn on a fan that blew cold air on me in a room that was already air conditioned to arctic temperatures. When I told him that the fan made me cold, he insisted that he needed it since he felt hot. Thailand is famous for its unique version of bodywork, Thai Massage, which is really a combination of massage and applied yoga stretches. There is a lot of information available about the benefits of massage. Nowadays there is plenty of scientific evidence that massage is good for your body. Massage is also good for your mind. It relaxes, de-stresses, and temporarily shuts off incessant mental chatter. The Thais have been well aware of both of these benefits for more than a thousand years. 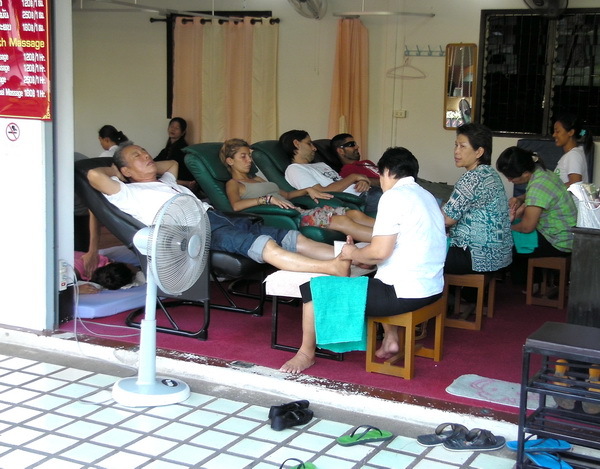 I am lucky to live in a place where massage is not a luxury, Chiang Mai, Thailand. At about $5.- an hour there is little reason not to indulge regularly. My personal measure for good massage is being able to fall asleep during the session. When I first came to Thailand over 14 years ago, I was fascinated by the Thai Massage system which is practiced everywhere. I fell in love with it and soon it became my new career. Receiving it also became one of my favorite leisure activities which is luckily very easy here. 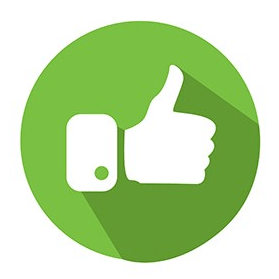 Continue reading…Is Massage Therapeutic or Relaxing? Continue reading…What is Thai Massage?